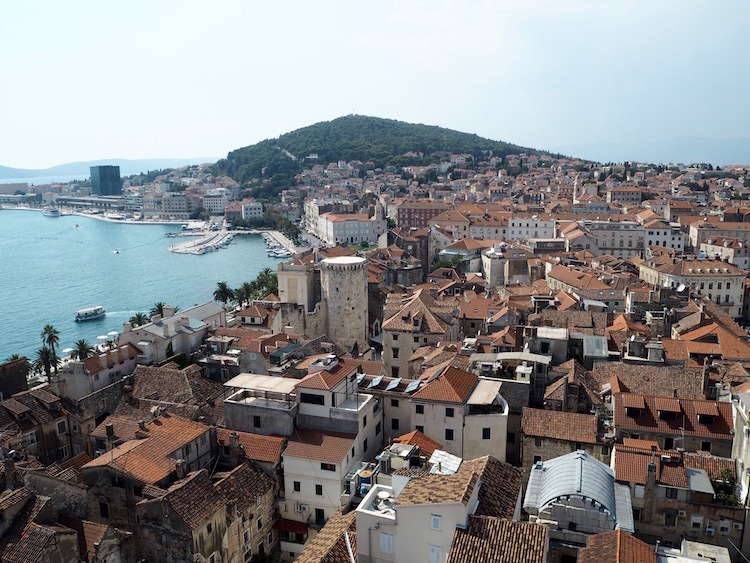 Split is a coastal city built on old Roman palace ruins. It’s the second largest city in Croatia after Zagreb and the second most touristy city after Dubrovnik. 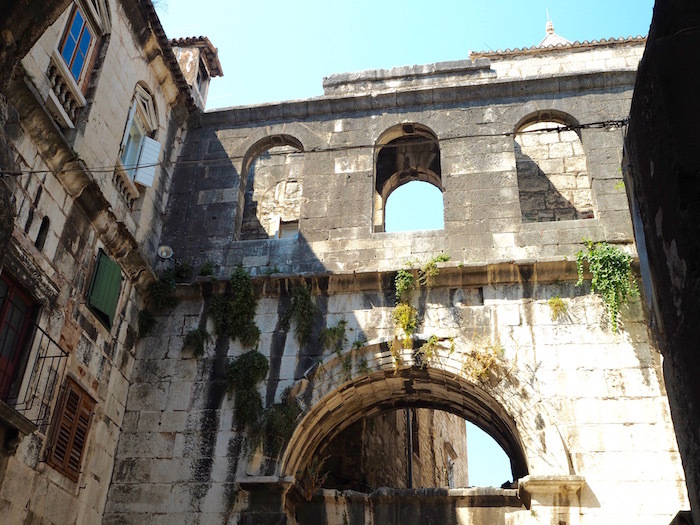 During our recent stay in Dubrovnik, we decided to take a private day tour to Split. This was probably not the smartest idea we had but we didn’t have much time in Croatia and we wanted to see as much as possible. After a 7.30am pick-up by our lovely driver Ivan from Cheap Dubrovnik Tours we made our way up along the coast to Split, which is a three hour drive from Dubrovnik. Yes, that’s a long drive! And funnily enough you will need your passport because you will pass through part of Bosnia and then get back into Croatia before you arrive in Split. Arriving in Split around 11am we only had around six hours up our sleeves. That isn’t a lot for such an interesting place and we knew we had to try and see as much as possible during that time. 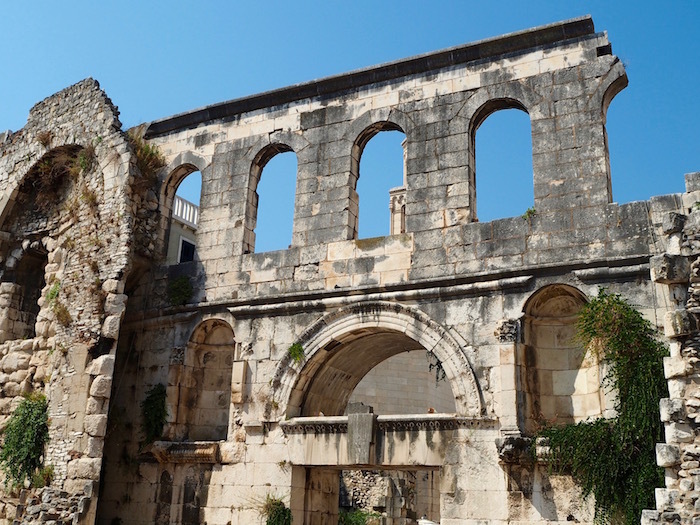 First off we decided to explore the Diocletian Palace, the main attraction in Split. 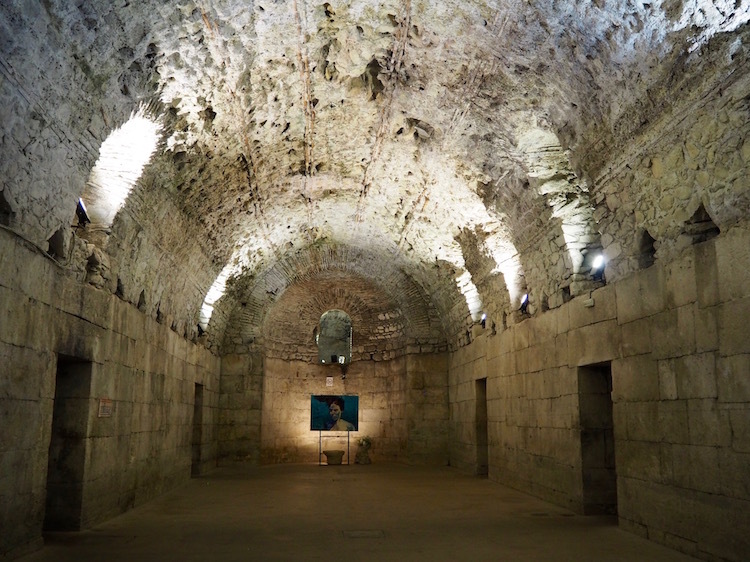 If there is one thing you should definitely not miss in Split, it’s the Diocletian Palace. 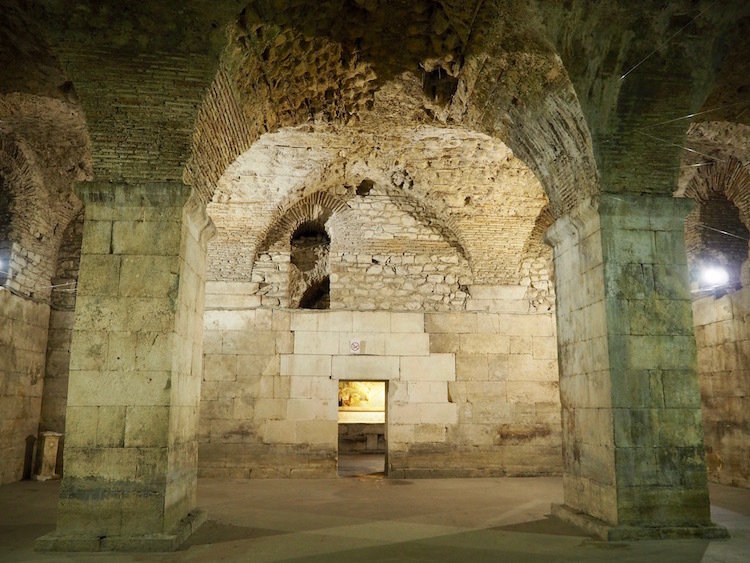 This Roman palace was built between the late third and the early fourth centuries A.D by the Roman Emperor Diocletian. It is one of the most imposing Roman palaces in the world and is now a UNESCO World Heritage Site. 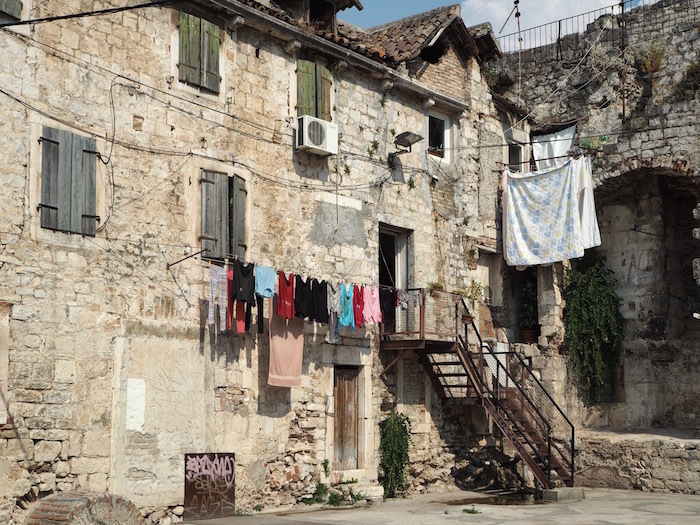 It covers half of the old town of Split and is incredibly well preserved considering how old it is. 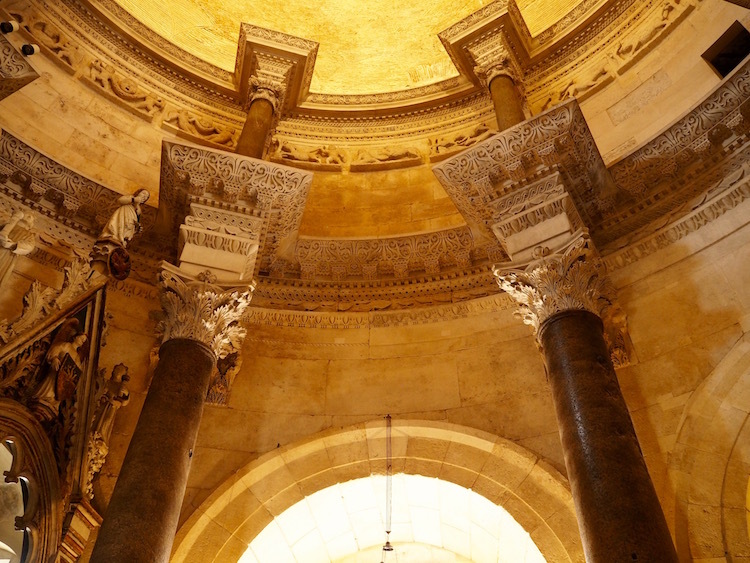 Diocletian built it with the intention of using it as his retirement home. Half of the palace was built for his personal use and the other half was used by the military garrison. 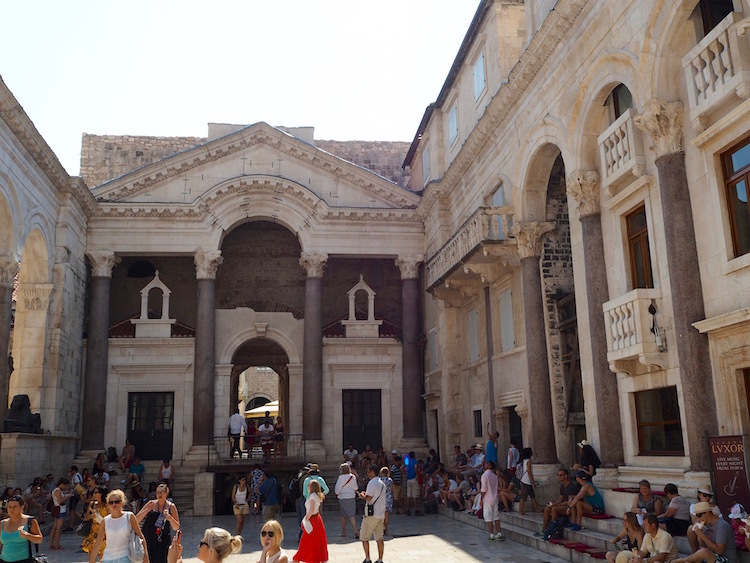 The palace was always Split’s main attraction but it recently became even more popular after HBO started using it as the City of Meereen and Daenerys’ throne room in their popular TV show Game Of Thrones. 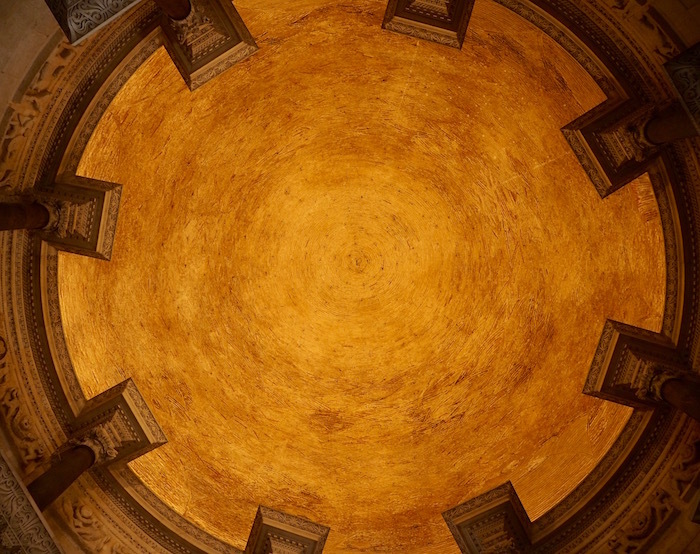 In the Centre of the palace, you will find the Peristil, the central square of the palace. 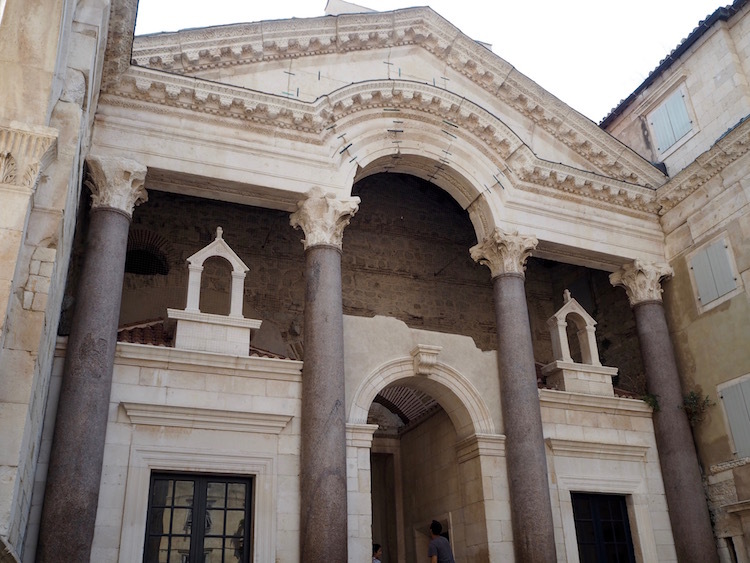 The Peristil was once the entry hall of the Diocletian’s Palace. It’s an architectural marvel, lined with Greek and Italian marble, red granite columns and a Sphinx statue from Egypt. We walked through the hall several times and depending on the time of the day it can be extremely crowded. If you go at twelve o’clock you will see the changing of the Diocletian guards (actually college students who do this for free). If you are in Split for a while, you should take the time to sit on the Peristil steps. 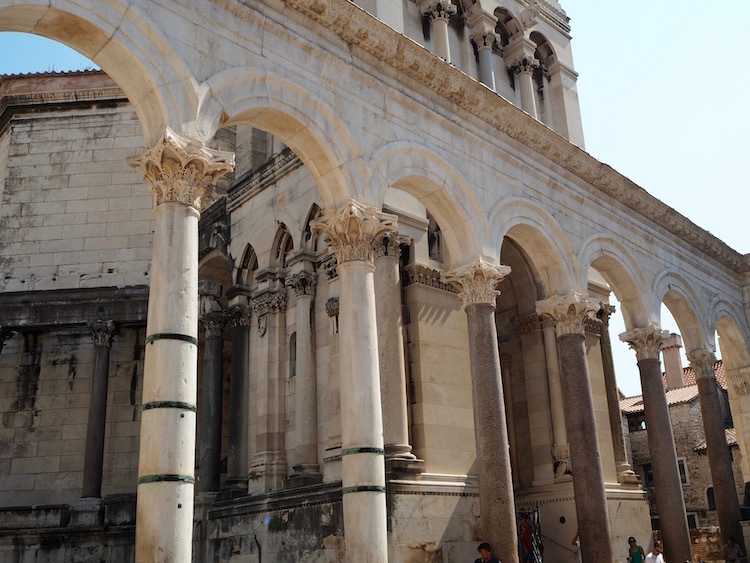 relax with a coffee or Croatian wine and check out the beautiful architecture. Next to the Peristil you will find the impressive cathedral of St Domnious. 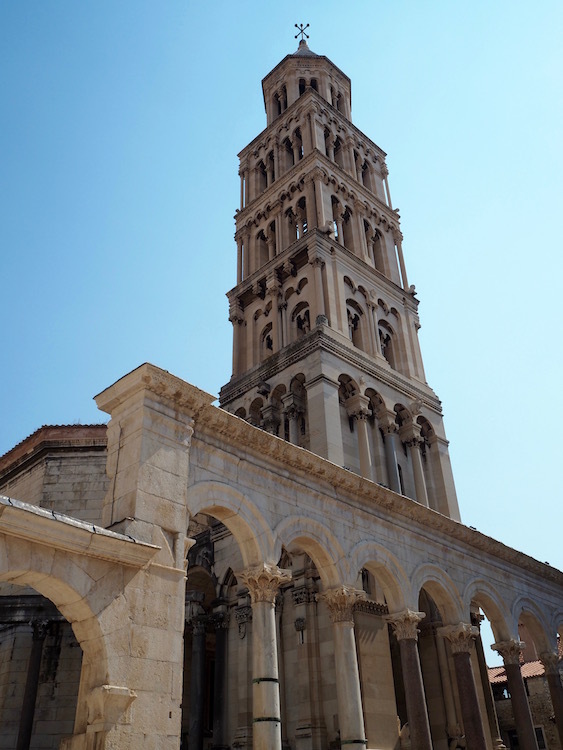 The cathedral was originally built as a Mausoleum for Emperor Diocletian, it was then converted to be a cathedral. It is remarkably well-preserved to this day. Twenty-four original columns encircle it and you will find two lion statues at the base of its bell tower. 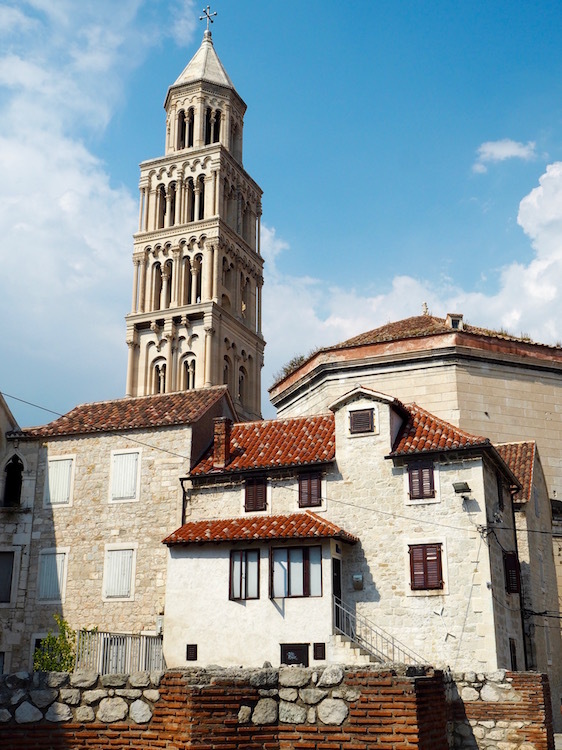 For a great view over the palace and the old town, you can climb the Bell Tower. 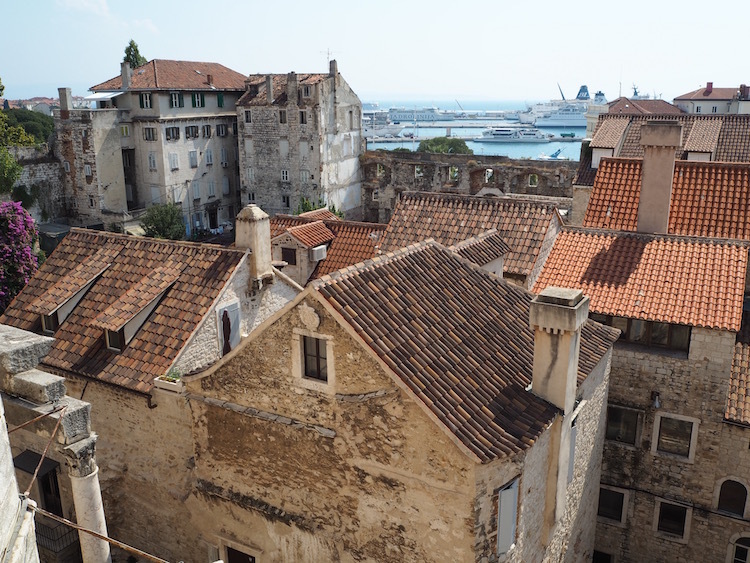 If you can manage the narrow ascent, and are not claustrophobic, the view of the red roofs, old town and magnificent harbour are totally worth the effort. A bit scary but fun! A combo ticket that includes the bell tower, Jupiter’s temple, crypt and church will cost you 45 Kunas. The cost to climb just the tower by itself is 20 Kunas. Another part of the palace to check out is the Basement Halls. There are two parts two the Basement Halls. The first is the main hall which you pass through on entry to the palace. The main hall is free and is full of craft and souvenir stalls. The second section has an entrance fee of 40 Kunas and is a labyrinth of empty rooms. The Basement Halls have played various different roles over the years. 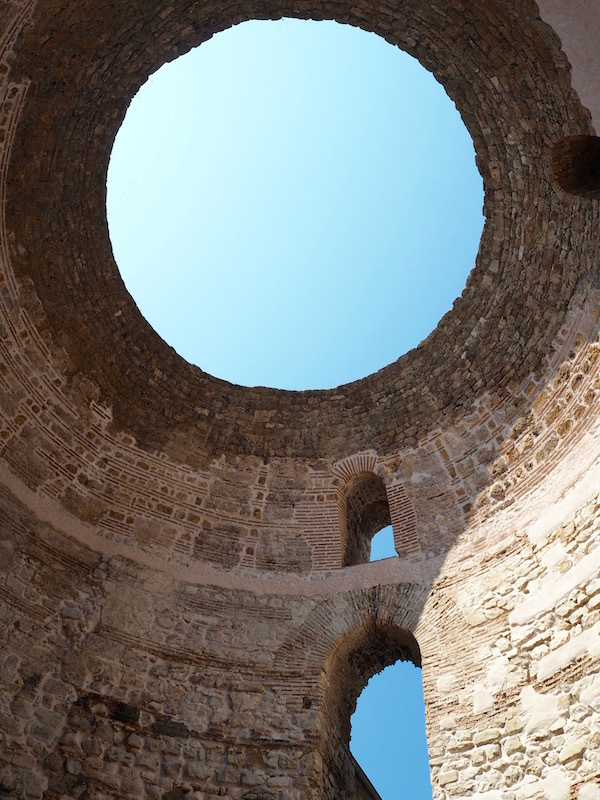 They were mainly used for storing wine and food during the time of the Diocletian Emperor. They subsequently became a garbage dump as the old town’s population grew. If you are a fan of Game of Thrones, the Basement Halls were the filming location for the Dragon’s Room and Queen Daenerys’ Throne Hall. Although nowadays there isn’t much to see inside these halls other than a few paintings here and there, they are interesting to visit and have an enchanting atmosphere; and not just because we are Game of Thrones fans! Spending time in the halls is also quite refreshing after wandering around outside in the heat! They are quite cool and you will notice water leaking from the ceiling in some of the rooms. 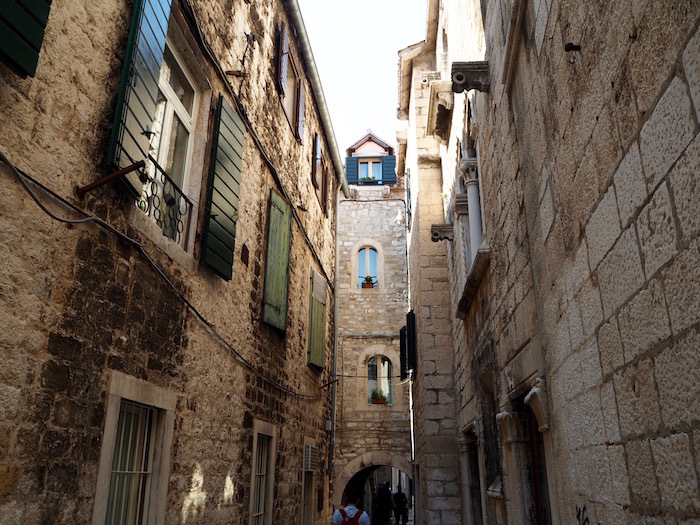 Wandering around the old palace and getting lost in its labyrinth of old streets packed with shops, restaurants and bars was the highlight of our few hours in Split. 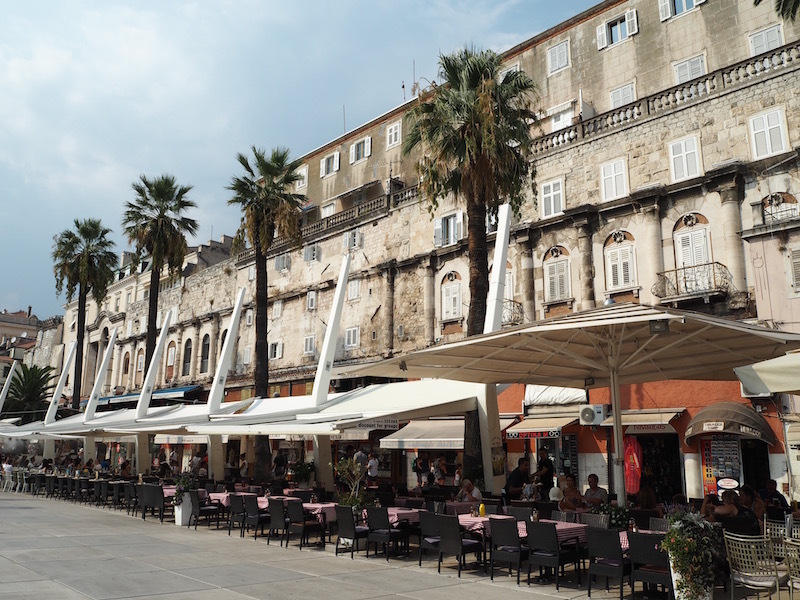 Like the old town of Dubrovnik, Split can be touristy but it is not quite as crowded. 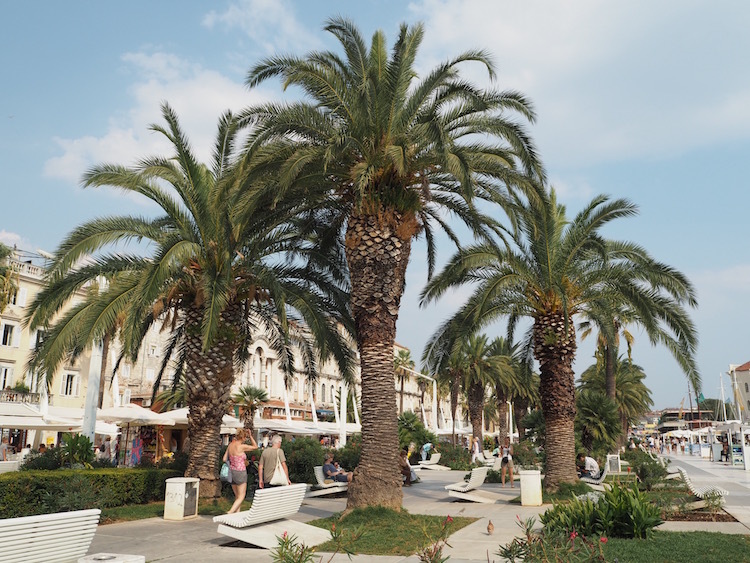 Get lost in Split’s old streets! Are you tired after a few hours of exploring the palace? Then it’s time to relax, grab a drink and do some people watching! The busy Riva Promenade just outside the palace walls is the best place to sit and watch the world go by, with a coffee or an Aperol Spritz in hand! Lined with palm trees, restaurants and cafes, it is popular amongst both tourists and locals. It’s also a great place for a stroll and has a beautiful view looking out over the Adriatic sea. You will see many catamarans, ferries and yachts in the port on their way to the nearby islands. If you love ice cream (and who doesn’t!) there are many ice cream places around the Riva selling delicious Croatian ice cream. Unfortunately, our time in Split was nowhere near long enough. 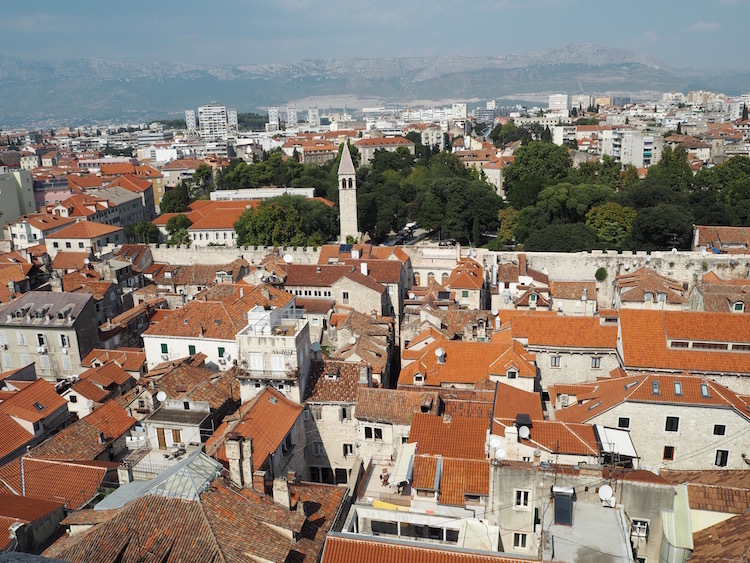 Split is not a big city, but it is still an interesting place with a fascinating history and a vibrant atmosphere, especially inside the palace. We would have loved to have spent the night there to experience the old town at night and regretted not staying longer. Catching a ferry to the nearby islands such as Hvar and Brac would also have been a great thing to do. We’ve heard they are amazing! So we made a promise to ourselves; we’ll go back one day and use Split as a base to explore the whole region!